An unprecedented Pentagon cyber-offensive against the Islamic State has gotten off to a slow start, officials said, frustrating Pentagon leaders and threatening to undermine efforts to counter the militant group’s sophisticated use of technology for recruiting, operations and propaganda. The U.S. military’s new cyberwar, which strikes across networks at its communications systems and other infrastructure, is the first major, publicly declared use by any nation’s military of digital weapons that are more commonly associated with covert actions by intelligence services. 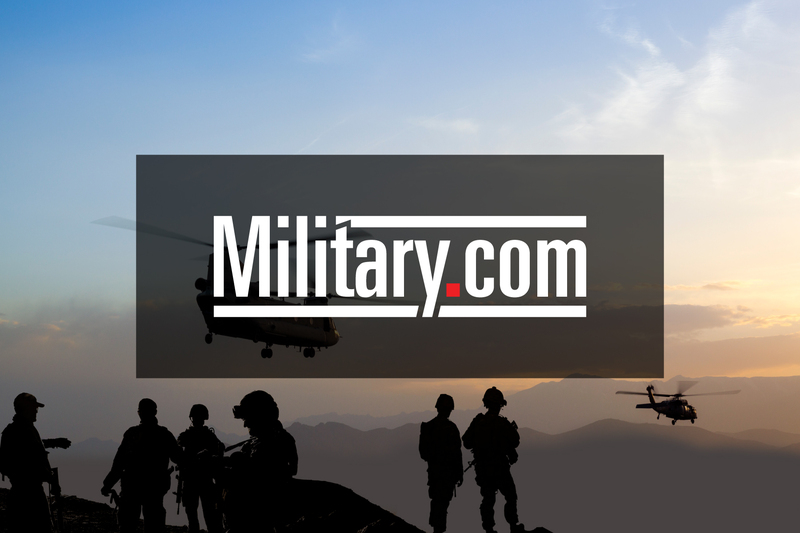 The debut effort is testing the ability of the military’s seven-year-old U.S. Cyber Command’s to conduct offensive operations against an enemy that has proved to be an adept user of technology to organize operations, recruit fighters and move money. But defense officials said the command is still working to put the right staff in place and has not yet developed a full suite of malware and other tools tailored to attack an adversary dramatically different than the nation-states Cybercom was created to fight. In an effort to accelerate the pace of digital operations against the Islamic State, the Cybercom commander, Adm. Michael S. Rogers, created a unit in May headed by Lt. Gen. Edward Cardon that is tasked with developing digital weapons — fashioned from malware and other cyber-tools — that can intensify efforts to damage and destroy the Islamic State’s networks, computers and cellphones. The group, called Joint Task Force Ares, is coordinating operations more closely with U.S. Central Command, which is leading the military fight, and working to sharpen offensive operations. Defense Secretary Ashton B. Carter has pressed Rogers repeatedly to pick up the pace of the nascent cyber-offensive, ensuring it plays a more active role in the overall campaign against the Islamic State. Although officials declined to detail current operations, they said that cyberattacks occurring under the new task force might, for instance, disrupt a payment system, identify a communications platform used by Islamic State members and knock it out, or bring down Dabiq, the Islamic State’s online magazine. The killing of 84 people celebrating Bastille Day is the worst attack on France since the 13 November attacks last year. France has been under a state of emergency ever since and security across the country was high, with intelligence services warning of the risk of further attacks. 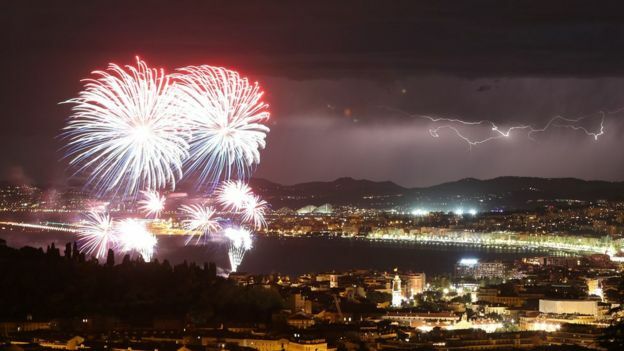 The terror began a little after 22:30 (20:30 GMT) on Thursday, shortly after thousands of people had watched a firework display on the seafront in Nice, at the end of a day marking France's national holiday, Bastille Day. There had been a mood of celebration and the crowd had enjoyed an air force display during the evening. 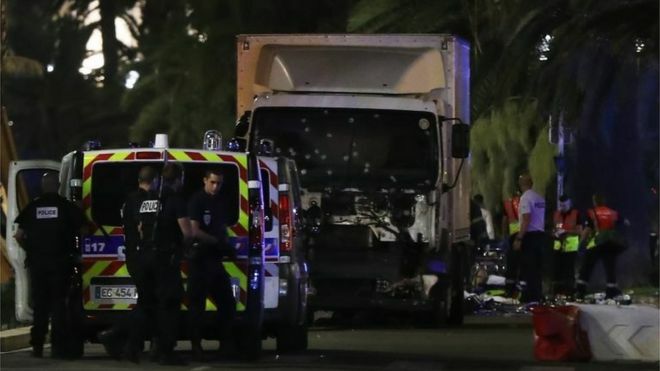 As families strolled along the city's renowned Promenade des Anglais, a large white lorry careered at full speed towards them. The vehicle mounted the kerb then went back on the road, zigzagging for up to 2km (1.25 miles), as the driver intentionally drove into the crowd. A local MP spoke of hundreds of people being run over. Police finally managed to bring the lorry to a halt near the luxury Palais de la Mediterranee hotel. "I was opposite the Palais de la Mediterranee when I saw a lorry at high speed running over people. I saw it with my own eyes, people tried to stop it," said one witness. Burhan Wani — the face of young, revived and local militancy in the Kashmir Valley — was killed last week by forces that resulted in an unforeseen law and order problem for the state apparatus and violent social unrest throughout Kashmir resulting in some thirty-five plus civilian killings and hundreds of injured, wiht the toll still increasing. Burhan Wani, who was just 22 years old, was called the face of a new and young militancy in the Kashmir Valley. This young chap even had surpassed Dr Shah Faisal –- the IAS topper of 2010 in fan fallowing who was then the inspiration for many Kashmiri youth. But Burhan was much famous now, and much more popular especially in the southern belt of Kashmir purely due to his use of technology and wide popular support in the region. Security apparatus used to call this tech-savvy militant, the poster boy of young militancy in Kashmir as he lured young locals to militancy in the valley. It was also believed that Burhan recruited youngsters and was the inspiration of many youth in Kashmir, therefore posing a serious threat to security apparatus. The threat of local militancy still continues even after his death, as believed some Kashmir analysts and local politicians. While I was in the valley forstudy on the annual holy Amarnath pilgrimage, I got stranded in the valley due to the death of this poster boy. Being a local, I stayed at my home and interacted with friends and acquaintances around on the situation that prevailed aftermath Burhan’s death. “If twenty more civilians die, Kashmir issue will reach some solution,” said an elderly man. Such thinking reflects that there is a section of society in Kashmir who thinks that only violence can solve their issues and with more killings of civilians there will be more of an impact. People perceive this as they have been witnessing only violence since 1989. Jammu and Kashmir sees violence just as matter-of-factly as most others see peace. It is marred by almost daily curfews and protests involving hundreds of thousands pouring out onto the streets. Incidents of violent stone pelting in response to gun-toting armed forces result in clampdown by the machinery of the state. This is Jammu and Kashmir today ; despite the complete weight of the establishment, violence has become a way of life. One of Asia’s apparently inveterate and almost ceaseless conflict has no political solution in sight. Mainstream political parties at both regional and national level are perceived as having no inclination towards resolution; Instead they pay lip service in times of uneasy calm doing little or nothing to seek dialogue with the stakeholders. The rhetoric remains the same, only the faces espousing the rhetoric change from one election to another. This has seen growing clamour from sections of civil society, academicians and indeed all right thinking individuals, shifting the focus inexorably to a questioning of New Delhi ’ s policy on Jammu and Kashmir (J&K) – is it simply erroneous or impervious to the demands of the times? Extant literature has ample proof of the utter disinterest that the state machinery has shown in any move towards resolution . As is often quoted mindless suppression by the state cannot make for an ideal climate of dialogue. Even if one discards Pakistan’s baseless claims on the state of J&K it is simply impossible to ignore a continuous and ever increasing demand for self determination. The youth fighting as armed militants today were not even born when trouble erupted in 1989-1990 but they have definitely grown up in a climate of sheer alienation, fear hatred and animosity towards the establishment which is unfortunately and largely denoted by the humongous presence of the Armed forces in the state. What no one has bothered to acknowledge are the aspirations of this youth, a constituency equally capable of swinging elections as of swinging public opinion. This is a generation which is adept at use of social media and the power of the Internet and indeed , do so, despite severe clamp downs by the government. Weeping, gnashing of teeth and rending of garments! Those were sounds emanating from Beijing following the July 12 ruling from the International Tribunal for the Law of the Sea. International law has a way of accommodating realities of power—of deferring to the strong. Kudos go to the jurists, consequently, for speaking truth to power—for upholding the plain meaning of the UN Convention on the Law of the Sea (UNCLOS) rather than softening their findings or declining to rule on the most contentious matters in hopes of fostering amity with China. John F. Kennedy would award them a profile in courage. Beijing, for instance, has proclaimed repeatedly, loudly and stridently that it commands “indisputable sovereignty” within a nine-dash line enclosing some 80–90 percent of the South China Sea. That includes exclusive economic zones (EEZs) apportioned to coastal states such as the Philippines, the claimant that brought its case before the UNCLOS tribunal. Indisputable sovereignty is a sea grab. And a land grab, even if much of the land is watery. At issue is Scarborough Shoal; the shoal is a submerged reef deep within the Philippines’ EEZ, extending two hundred nautical miles offshore and grants the coastal state exclusive rights to tap natural resources in those waters and the seafloor beneath. China’s coast guard and navy shut their Philippine counterparts out of the waters at Scarborough Shoal—that is, out of waters allocated to Manila by treaty—four years ago. Chief of Naval Operations Adm. John Richardson and People’s Liberations Army Navy head Adm. Wu Shegli. The U.S. Chief of Naval Operations is headed to Beijing next week to meet his Chinese counterpart, a Navy official told USNI News on Thursday. Adm. John Richardson will spend three days in China starting on July 17, will meet with his People’s Liberation Army Navy counterpart Adm. Wu Shengli, tour the PLAN’s submarine academy and its lone carrier Liaoning, according to a release from the service. It will be Richardson’s first trip to China since becoming CNO. His predecessor – retired Adm. Jonathan Greenert – met with Wu several times during his tenure and developed a close working relationship. “I have been looking forward to this trip and to meeting Admiral Wu for some time,” Richardson in a statement. Richardson’s visit will come a week after an international tribunal issued a ruling that invalidated many of Beijing’s claims to extensive holdings in the South China Sea – a ruling Chinese leadership said they would not recognize. With its hard line, China has painted itself into a corner while increasing the chance of conflict with its neighbors. An international court’s stinging verdict, denying China’s claim to ownership of virtually the entire South China Sea, has put a spanner in the “China Dream” of President Xi Jinping and left him with a series of difficult options. When he took over leadership of the Chinese Communist Party in November 2012, Xi made the China Dream – described as “the great revival of the Chinese nation” – his signature mission. To symbolically underline the importance of the South China Sea to this initiative, among his first visits outside Beijing as the new party boss was to meet the sailors aboard the Haikou, a guided-missile destroyer which had patrolled disputed waters in the sea. Two days ago, the Permanent Court of Arbitration (PCA) at The Hague issued a truly stunning and long-anticipated ruling in the Philippines vs. China case over the South China Sea. After three years of deliberations, initiated by the Philippines and in which China refused participation, the tribunal’s 500-page ruling dealt a knockout blow to Beijing’s expansive maritime claims. Most notably, the court ruled that China could not use its nine-dash line to claim “historic rights” to resources in the South China Sea. It also made a surprising ruling on the legal status of the land features in the Spratly Islands, judging that it is composed entirely of reefs and rocks as opposed to islands, and that none can claim more than a 12 nautical mile territorial sea. In so doing, the court effectively enclaved China’s island outposts in the Philippines’ exclusive economic zone, making it impossible for it to claim broad swaths of sea or the resources that lie beneath. There are several caveats to this landmark ruling. First, and as ever, international law has no formal enforcement mechanism — there are no Hague Marines to ensure that China does not claim more than a territorial sea from therocks it occupies in the Spratlys. Second, China has not complied with the proceedings from the start, put the world on notice that it would not abide by the decision, and has given no signal that it intends to change course now. The judgment, decisive as it is, will therefore be difficult to implement to the letter. But the Philippines initiated its case knowing this would likely be so, and no seasoned observer has ever expected China to decamp from its artificial outposts following juridical defeat. Nonetheless, the decision may have a meaningful impact on the geopolitical dynamics around the South China Sea disputes. As analysts pour through the voluminous decision and what it means for the UN Convention on the Law of the Sea (UNCLOS), we therefore turn our attention to the major political questions that will abound in the weeks following the decision, and how these will ultimately inform the strategic landscape that the next U.S. president inherits in the South China Sea. Question 1: Will China Take Some Countervailing Action? Beijing is faced with a trifecta of problems. Most gut-wrenchingly, the Hague-based Permanent Court of Arbitration handed down the decision inPhilippines v. China that ruled against Beijing, removing any legal basis for China’s territorial claims in the South China Sea. As a follow-up punch, South Korea agreed to the deployment of the Terminal High Altitude Area Defense (THAAD), a United States Army anti-ballistic missile system with radar penetration that weakens China’s offensive missile capabilities. Lastly, and surely agitating historical wounds, Japanese national elections gave Prime Minister Shinzo Abe’s Liberal Democratic Party (LDP) and their allies a supermajority in parliament, opening the door for Japan to expand their military capabilities. Where Are the Protests in China? Chinese didn't waste any time venting their anger at the Hague'sruling against their country's territorial claims in the South China Sea. Within minutes of the news, Chinese social media was flooded with thousands of comments parroting a testy, often profane nationalism. What China hasn't witnessed yet, however, is any semblance of the mass protests that roiled dozens of Chinese cities, sometimes violently, in 2012 after a similar territorial dispute with Japan erupted into the headlines. And the fact is, that's not likely to change. Unlike in 2012, Chinese censors almost immediately began deleting the most inflammatory posts about the verdict, such as calls for war in the South China Sea. At times, officials blocked people from evensearching the term "South China Sea" on leading social media outlets. Authorities also quickly threw up a police cordon around the Philippine embassy in Beijing to thwart any demonstrations. 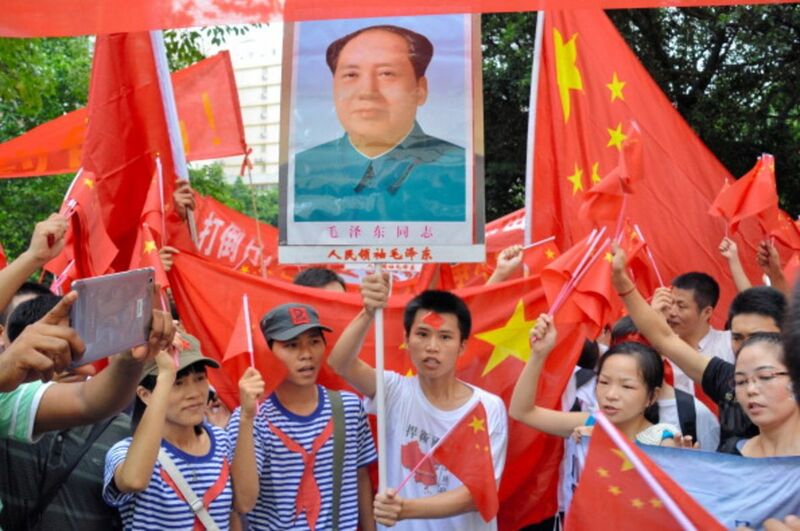 That hardly means that the Chinese government agrees with the tribunal's verdict (which it's denounced as "null and void"), or even that officials are all that squeamish about anti-foreign sentiment. In 1999, following the accidental U.S. bombing of the Chinese embassy in Belgrade, then Chinese Vice-President Hu Jintao explicitlyauthorized protests outside the U.S. embassy. In 2012, the government initially seemed to be encouraging popular rage against Japan. And as recently as 2014, after a Malaysian Airlines jet carrying 152 Chinese passengers disappeared in the South Pacific, authorities allowed anangry crowd to besiege the Malaysian embassy and demand compensation for the families of victims. NIC KNOCK: The National Intelligence Council (NIC) is an arm of the Director of National Intelligence charged with producing finished intelligence reflecting long-term strategic analysis based on the views of the entire intelligence community. The NIC’s premier product is the National Intelligence Estimate (NIE), a document designed to give policy makers the IC’s best judgment on complex issues. But a Dead Drop source tells us that the NIC has produced no NIEs in 2016 at all. The NIC elders (called National Intelligence Officers or “NIOs”) have been producing lots of short papers for NSC Principals and Deputies – but the NIE drought comes at a time when you would think the nation’s leaders could really benefit from some help in their strategic thinking on the myriad of national security challenges currently facing the nation. Why Are More Troops Headed To Iraq? Secretary of Defense Ash Carter announced Monday that the president had authorized the deployment of 560 U.S. troops to Iraq to aid in the looming assault to retake the city of Mosul. While it is possible these troops will provide tactical utility for Iraqi forces, the move exposes the Administration’s lack of strategic understanding and Congress’s continued abdication of its constitutional responsibilities. What should matter to Washington, however, isn’t so much the tactical potential as it is strategic outcomes. Here is where the administration’s approach to Iraq comes up well short. In recent months the ISF has made notable tactical progress in recapturing ISIS-held territory, including a number of important cities. Mosul is the next target and is also by far the largest and most important terrain. ISIS may well fight fiercely to defend its so-called “capital” in Iraq, but Mosul’s loss will not signal the end of the organization. It might actually increase the risk to the American homeland of ISIS-inspired terror attacks. The bulk of the training may be held indoors to avoid detection from US drones. Senior AQAP leaders, including Khalid Batarfi and Ibrahim al Qosi, give speeches in the video. An Austrian court sentenced a Muslim radical preacher, Mirsad Omerovic, better known as Ebu Tejma, to 20 years in prison for recruiting volunteers for Islamic State. A court in the city of Graz on Thursday found Omerovic guilty of being a member of a terrorist organisation and recruiting young volunteers for the so-called Islamic State. According to the public prosecutor, the 34-year-old preacher “brainwashed” dozens of people aged between 14 and 30 in order to convince them to become jihadi fighters in Syria. Omerovic, who was originally from the town in Tutin in Serbia and then lived in Bosnia, moved to Vienna after Yugoslavia collapsed. He then started preaching in several cities in Austria and southern Germany, becoming one of the key figures in promoting IS, according to the prosecution. He still holds Serbian citzenship, Austrian newspaper Die Presse has reported. He was arrested in November 2014 during a police operation against a jihadist network operating in the country. Omerovic denied the charges against him, AFP news agency reported. Daesh (Islamic State) has been finally facing its difficult days during recent months as the number of air strikes against its positions has been rising while the terrorist group has been facing limitations in terms of money and weapons. This, however, does not mean that we must rest at ease. The latest terrorist attacks in Saudi Arabian city of Medina and Turkey’s port city of Istanbul, which were extension of previous terror attacks in Europe all of which were claimed by Daesh, show another aspect of how a terrorist outfit with great expectations is losing power. Therefore, during coming months, and if the determination for the elimination of Daesh continues to exist among powers involved in the Syria crisis, we may witness more terrorist attacks in various countries. Like any other terrorist organization, Daesh is hoping that such attacks would finally force governments fighting it to give up policies that are meant to weaken Daesh. Interestingly enough, those countries, which in the past years had defined their interests in the Middle East in parallel to those of Daesh and other terrorist groups operating in Syria and Iraq, are now more prone to the group’s retaliatory attacks. Saudi Arabia is not only among the most important supporters of extremism across the world, but, due to high number of its citizens who believe in extremist ideologies, is also very apt to experience a form of unrest, which has its roots in terrorist operations aimed at toppling West’s allies in the Middle East. Turkey is another unfortunate target for terrorist groups. One reason is that before the beginning of the war in Syria and the mistakes made by Turkish President Recep Tayyip Erdogan’s government in pursuit of its most ambitious geopolitical aspirations in past decades, the country had provided terrorist groups with no motivation to attack it except for what it had already experienced in its long war with the Kurdistan Workers’ Party (PKK). Of course, unlike countries, which sooner or later had no choice but to fight extremism, Ankara could have headed off the dire situation it finds itself in now. Across Republican and Democratic administrations, the United States has taken pride in standing by its friends and allies around the world when trouble commences. Acting side-by-side with allies in the Middle East, Europe, and Asia is often considered one of the bedrocks of a bipartisan U.S. foreign policy establishment; when a friend is in need or its security is threatened, the U.S. is quick to rise up and provide critical assistance often to the tune of billions of dollars. That foreign policy tenet, however, is increasingly causing the United States more grief than benefit, particularly when America’s allies are engaging in activity that is at best questionable and at worst against international humanitarian law. Washington’s logistical aid to the Saudi-led Arab coalition fighting against the Houthis in Yemen fits that category perfectly. An operation that was launched in March 2015 for a legitimate objective — defending the internationally recognized Yemeni government — has turned into a stalemate that has produced nothing but misery for millions of Yemeni civilians simply trying to survive. Yemen, already the Arab world’s poorest country before the war began, has been devastated in terms of economic productivity, political stability, and global health indicators. The United States Air Force might deploy the Lockheed Martin F-35 Joint Strike Fighter to the Baltics for an air-policing role once the new stealth aircraft becomes operational later this year. The new fighter is to enter service with the Air Force with an interim software capability called Block 3i that offers limited combat capability. Carlisle said that the F-35 deployments would be similar to those carried out by its larger twin-engine Lockheed Martin F-22 Raptor stable-mate—that is to send a message to potential adversaries such as Russia. The Air Force’s elite Raptor squadrons often undertake theatre security package missions where twelve jets will deploy to a location for a period of time. More recently, F-22 units have been practicing deploying smaller packages of up to four aircraft called Rapid Raptor—which was pioneered by Lt. Col. Kevin ‘Showtime’ Sutterfield at the 477th Fighter Group in Alaska. Russia is expanding its undersea operations as part of a broader strategy of coercion aimed at its neighbors, NATO, and the United States. Russia has a long history of emphasizing its maritime capabilities for the purpose of strategic signaling, including the use of targeted provocations. Suspected territorial incursions in the Baltic Sea and provocative patrols in the North Atlantic have caused alarm among NATO and partner nations, in part because they have underscored the extent to which NATO and regional partner antisubmarine warfare (ASW) capabilities have atrophied since the end of the Cold War. The Russian Navy and its submarine force have remained somewhat insulated from the economic and personnel challenges impacting Russia’s broader military modernization efforts. Moscow has demonstrated an unwavering commitment to the development and maintenance of its submarine-based strategic deterrent and has emphasized nonnuclear submarine capabilities, certain surface warfare capabilities, and long-range antiship missiles over carrier battle groups, for example. For this reason, Russian submarines are generally believed to be very capable vessels when properly maintained. In Northern Europe, the Russian Navy’s use of submarines to signal presence, reach, and power achieves an effect that is disproportionate to the resources committed. On 6 July, the Obama administration introduced a new set of North Korea-related sanctions: this time, the North Korean hereditary dictator Kim Jong-un is targeted personally. Announcing the new measures, a US Treasury official said:' Under Kim Jong-un, North Korea continues to inflict intolerable cruelty and hardship on millions of its own people, including extrajudicial killings, forced labor and torture'. It is difficult to argue against such a statement. North Korea — in spite of unnoticed but considerable liberalisation in the last two decades — remains one of the world’s most repressive societies. Kim Jong-un inherited the system from his father and grandfather but, presumably, he also has a responsibility for the 'extrajudicial killings, forced labor and torture' cited by the US. Accepting the premise however, still leaves some questions: What is the reason behind such a rather unusual gesture? What do the US and the international community more broadly hope to achieve by classifying Kim Jong-un and a dozen other top officials of the regime as violators of human rights? The action is clearly not driven by dreams of universal justice; after all, there are many authoritarian rulers worldwide who have not been subjected to such sanctions. There is also little chance this decision by the Obama administration will prompt Kim Jong-un change his ways: he knows that he will stay in power only as long as his subjects are docile and terrified, and he will continue to do what is necessary to keep them that way. The punishment itself is purely symbolic: the sanction means Kim Jong-un’s personal accounts are targeted, but it is an open secret that the ruling Kim family, first, does not keep their money under their real name, and, second, does not necessarily distinguish between the state and individual funds. The Ground-Based Missile Defense System hit a simulated enemy missile over the Pacific in the first successful intercept test of the program since 2008, the Defense Department said. WASHINGTON -- The system designed to defend American cities and towns against a nuclear attack by North Korea is "simply unable to protect the U.S. public" and will remain ineffective unless Congress exerts rigorous oversight, according to a new report. The report, to be released Thursday by the Union of Concerned Scientists, recommends that the Obama administration halt the expansion of the Ground-based Midcourse Defense system, known as GMD, until its technical problems have been solved. "The story of this system is a cautionary tale about how the lack of appropriate oversight of a politically charged missile defense program has led to a system in tatters," said the report, written by three physicists with expertise in missile defense. "Despite more than a decade of development and a bill of $40 billion, the GMD system is simply unable to protect the U.S. public," the authors wrote. The GMD system is intended to thwart a "limited" nuclear strike by a non-superpower adversary, such as North Korea or Iran. Britain’s exit from the European Union is a huge blow to European project with potentially devastating implications for its’ latest flagship policy – Energy Union. The United Kingdom has been one of the strongest proponents of EU energy market integration, liberalization, and diversification. By using the power of consorted action, Energy Union was intended to confront gas monopolies, such as Gazprom, in the fight against price discrimination and market distortions. As fallout from Brexit rattles Brussels, Kremlin-backed Gazprom is well positioned to seize the moment to recapture this lucrative market for Russian gas. This article takes a closer look at recent developments in European Union energy policy and examines opportunities for Gazprom to gain a stronger influence over downstream energy relations in the continent. The State of the Energy Union was created by the European Commission in February 2015 on the following promises: diversification through embracing LNG exports from alternative suppliers, market integration by building gas interconnections among EU member states, and ownership unbundling of critical gas infrastructure. Despite member states’ pledge for unconditional support of this policy, public support for the Energy Union has been dismal. The controversial Nord Stream- 2 pipeline along with Gazprom’s recent acquisition of strategic gas storage facilities within the EU have raised eyebrows across Europe’s capitals. Delays in building critical gas transmission lines between northern and southern Europe further eroded public confidence in European Energy Union. Several developments account for the decade-long stability along the Israeli-Lebanese border. Among them are Hezbollah’s costly preoccupation in the Syrian arena, where it has become a key actor with thousands of boots on the ground; the party’s long recovery process from the 2006 war; Israel’s recurring military entanglements in the Gaza Strip; Iran’s desire to keep Hezbollah in reserve as a retaliatory force against a potential military attack on its nuclear program; and a general lack of appetite for another mutually destructive confrontation. At least 80 people have been killed, many of them children, and 100 injured after a truck crashed into a crowd in an attack in the French city of Nice. The incident took place on the seafront during a Bastille Day firework display. Hollande said 10,000 military officers around the country would be mobilized and sent to Nice, borders would be strengthened, the national state of emergency extended, and military campaigns in Syria and Iraq will continue. French Interior Minister Bernard Cazeneuve confirmed on Friday that at least 80 people had been killed and 18 were in a critical condition. Authorities say the driver of the vehicle was armed. “There were guns in this vehicle and larger weapons, but I can’t say more than that because that is the prosecutor’s job,” said Christian Estrosi, president of the Provence-Alpes-Cote d’Azur region where Nice is located, according to the AFP. An Arrow II for Canada?